If you’re looking for an elegant Las Vegas Wedding Reception Location, we can help. We have three gorgeous banquet rooms to choose from, and we offer package options so that you can have everything arranged in advance, simply and easily. Choose from our Swan Banquet Room, Grand Banquet Room or our intimate Waterfall Banquet Room for your reception—no matter which you choose, you won’t be disappointed! At any of the three banquet rooms, you can select the Grace Reception Package. The Grace Reception Package is available for up to 50 guests, and additional guests can be added for $50 per person. It includes all of the above inclusions from the Splendor package, plus a cash bar for your guests. This means your guests will be able to purchase alcoholic beverage options and will be served by someone minding the cash bar; you can upgrade to offer beer and wine for your guests or full bar selections for an extra fee. Additionally, the Grace package includes a larger, 3-tier cake. As you can see, there are multiple reception choices, each of which can be customized to meet your needs! Each reception option has a fully-inclusive package price, and add-ons can be utilized to customize the package. There is a 14% service fee, and 8.25% sales tax. As noted above, we have three gorgeous banquet rooms to choose from when creating your dream reception setting with Always & Forever. The three rooms are the Swan Banquet Room, the Grand Atrium, and the Waterfall Banquet Room. No matter which you select, we’ll do all the work—we’ll have it all set up and ready for you, and we’ll coordinate with the caterers to ensure everything is ready. The lovely Swan Banquet Room includes lake views, to allow your guests a relaxing atmosphere for the reception. With all of the reception options, you’ll still have the ability to customize to your liking. We offer over 20 different linen colors to select from, and you’ll be able to work with the DJ to play the music you prefer. We have award-winning caterers providing the food, and you’ll have a lot of food options to be sure you can get something to your (and your guests’) liking. And the cakes can be customized with the colors and flavors you want. They’ll be delivered right to us—you won’t have to worry about anything. 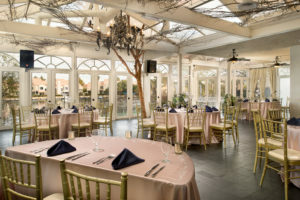 As the name implies, the Waterfall Banquet Room has a beautiful garden area with a large 6 foot waterfall that adds a peaceful serenity to any event. Your guests can relax while dining on the delicious food options you’ve selected. With each of these locations, you can choose from the Splendor, Grace, Elegance, or Radiance package options. The Grand Atrium Banquet Room also boasts calm lake views to enjoy throughout the reception, and has the same inclusions and options as the other choices—it really is up to you! We are located at 2620 Regatta Dr #109, Las Vegas, NV 89128. You can call us at (702) 318-5683 to schedule today! 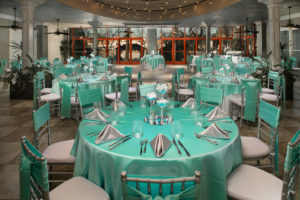 At Always & Forever Weddings & Receptions, our staff has ample experience to put together a professional and beautiful Las Vegas wedding reception to meet your needs. We’ll help you customize one of the packages on offer to create a reception that coordinates with your wedding colors and details while keeping things simple by making all of the arrangements here. We are here to make the entire process simpler for you. We’ve just outlined our reception-only packages above. To make your selection and select what customization’s you’d like, you can get started right here online, or feel free to call us at (800) 259-2978 or (702) 318-5683. Our professional wedding consultants are here to help, whether you need to plan the ceremony, reception, or both!